This is my usual breakfast these days. 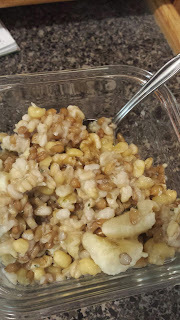 Whole grains, hemp seeds, walnuts, and banana. It tastes like banana bread. The night before, I put the grains and water in the rice cooker. I set it on delay to finish by the morning, when I want breakfast. The rest of the family adds their own favorite toppings. But for now, these are my favorites.